We can provide drop-end skip options to ensure easy loading of heavier waste materials. Please state on order form which way you would like the drop end to face so we can drop down correctly. Our Drop-End skips are available for medium and larger sized jobs. Fill in this quick quote form and one of our dedicated team members will get back to you as soon as possible. Terms and conditions apply. Want an instant quote? Just give us a call on 01235 760555. The 4yd open skip option is ideal for kitchen and bathroom refit waste. The skip will take approximately 40 bags of waste. The 6yd open skip option is our most common builders skip, this is ideal for bulky or heavy waste (Soil/Hard-core only). The skip will take approximately 65 bags of waste. The 8yd open skip option is ideal for light bulky waste types. The 10yd open skip is ideal for large household clearances, we can even provide an enclosed version. The skip will take approximately 85 bags of waste. For those with the larger waste clearance needs, we offer a range of roll-on-roll-off container hire which can also be delivered and collected. For those with the largest waste clearance needs, our 35/40yd RO/RO container is the perfect solution. We also offer delivery and collection. Our open skips are the most common style used by builders and are perfect for larger bulky waste. Closed skips are perfect for inner city works as they are more secure by preventing any unauthorised use of the skip. 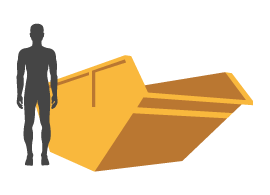 Our Drop-End skips are ideal for jobs that involve continual loading of rubble as they allow this material to be wheeled in, preventing stain injuries. Our RO/RO containers are the best match for larger contractual work, taking most types of rubbish they are capable and effective. Please tick this box if you would like to opt in to our newsletter mailing list. I consent to my submitted data being collected and stored via this form. The submitted data in this form collects your name, email address, telephone and postcode. Please click here to view more information about how we protect and manage your submitted data. 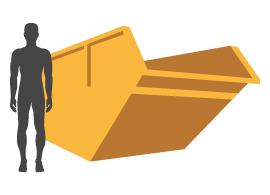 A Drop-End skip enables bulkier building materials to be loaded into a skip easily via a ramp that is perfect for wheelbarrows. This feature, whilst reducing the risk of strain injuries, can also save you time and money. Our mini skip hire offers a surprisingly robust option that's perfect for house and garden clearances. Our small skips are both manageable and durable, making them ideal for small projects and one-room refit waste. Our large skips can come either as open or closed and are ideal for larger commercial projects and site clearances. Our domestic skips come in a variety of types and sizes from mini to 10yd models, making them suitable for all domestic properties and projects. For those with the largest waste clearance needs, we offer a range of roll-on-roll-off container hire which can also be delivered and collected.